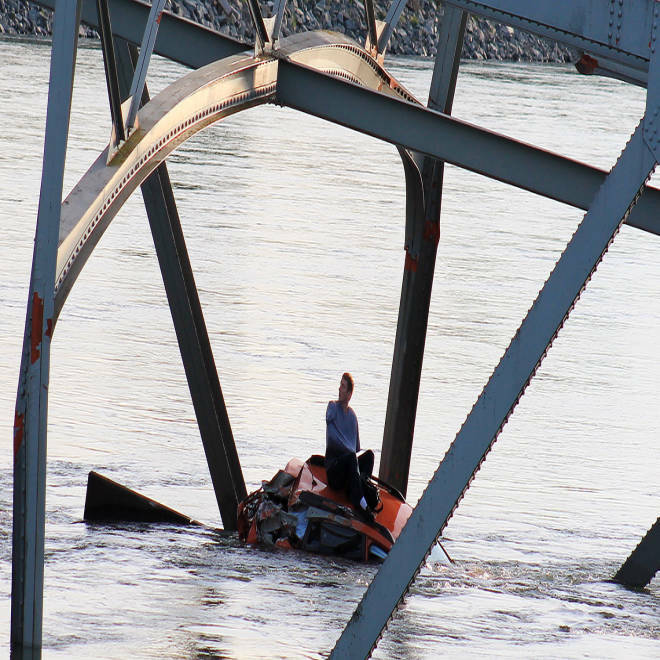 A man is seen sitting atop a car that fell into the Skagit River after the collapse of the Interstate 5, Thursday. A driver said he thought he was about to die when an Interstate 5 bridge span collapsed in Washington state, plunging his pickup and another car into the Skagit River below. Dan Sligh, his wife and another motorist found themselves waist-deep in water when the freeway crumbled moments after the bridge was clipped by an oversized truck, he told NBC affiliate KING5 of Seattle. State officials said the rescue had been “amazing” and warned of major traffic disruption following the complete closure of the section of the road, near Mount Vernon. A large portion of the 57-year-old Skagit River Bridge north of Seattle fell into the rushing river below Thursday evening, sending two vehicles into the frigid waters. KING TV's Chris Daniels reports. He said he managed to release his seat belt and climb out of his mangled truck to shallower water, despite fearing he had dislocated his shoulder. His wife also escaped, and was being kept in the Skagit Valley hospital where she was being treated for internal bleeding. "I thought we were done," Sligh told KING5 outside the hospital late Thursday. “When I look at all the carnage, all the metal, I assumed that was it at that point. But here we stand." The couple waited 90 minutes on the roof of pickup awaiting rescue, he said, adding that the other driver was not seriously injured. I-5 is the main freeway that runs up and down the West Coast between the Canadian and Mexican borders, and traffic was significantly backed up in both directions overnight. The bridge collapse was caused by an oversize truck, which had a permit, that hit an overhead span, officials said. The driver of the truck was cooperating with investigators, police said. At an afternoon briefing, Washington Gov. Jay Inslee called for patience while officials work on a plan to reopen the I-5 corridor. He said an investigation into who is at fault is underway, but "we want to discourage drivers from crashing their trucks into state bridges." The 1,112-foot steel truss bridge, built in 1955, was described by the Washington State Department of Transportation, after an inspection in August 2010, as "somewhat better than minimum adequacy to tolerate being left in place as is." Diversions have been set up and plans are already underway to install a replacement span, said Bart Treece, a spokesman for the department, describing the lack of more serous injuries as “amazing." Officials are trying to find a pre-fabricated structure they could use as a temporary replacement for the bridge before they decide how to repair or replace it. The section of the freeway carries 71,000 vehicles a day, Treece said, warning significant delays were likely over the Memorial Weekend. “If you can reduce trips or take another route, that would help,” he said. The minimum vertical clearance on the bridge (distance from the road to something a truck can bump into) is 14.5 feet. The standard height is 16 feet. Inslee's statement added: "We will be involved in a vigorous and diligent effort to get traffic flowing again through the Skagit bridge corridor and I will issue an emergency proclamation [Friday] to make sure we have the resources to do so as quickly as possible." One study reports that 11.5 percent of the nation's bridges are "structurally deficient," but politics often get in the way of funding infrastructure projects. NBC's Tom Costello reports. The bridge was of a "fracture critical" design, as are 18,000 bridges nationwide, meaning it could collapse if even one part failed. Even after the bridge collapse that killed 13 people in Minneapolis in 2007, a haphazard system of inspections continued, with federal authorities choosing not to require re-inspection of all the fracture-critical bridges. In a survey of every state by msnbc.com in 2008, only six states and the District of Columbia said they began to recheck all their fracture-critical bridges. Officials in Washington state, like in most states, said they performed special inspections of only their few dozen bridges of the particular deck-truss design used in Minneapolis. The bridge that fell Thursday did go on to receive its regular inspections in 2008 and 2010, according to the federal records, called the National Bridge Inventory. NBC News' Andrew Rafferty and Justin Kirschner contributed to this report.